Do you want a nice place your family or friends want to come back to every year? The Round House is the home for you. It is cozy, clean, comfortable, and has amazing ambiance. It has 5 private bedrooms, 3 bathrooms, and two living areas. We are fortunate to have many returning guests. During the day ski the moguls at nearby Winter Park/Mary Jane Resort then take the kids tubing at the old fashion Fraser Tubing Hill. Afterwards warm up with hot cocoa by the wood fire or in the 8 person outdoor hot tub, soaking in the serene forest and meadow views. 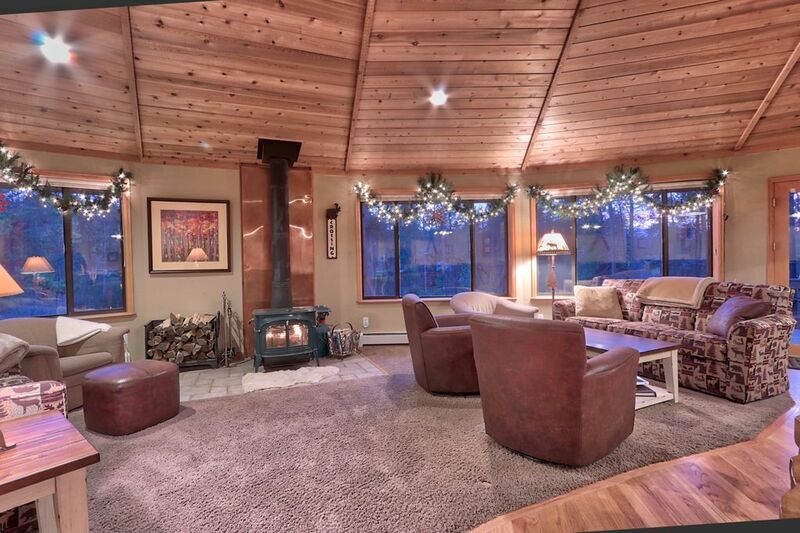 This spacious, tastefully decorated 'Round House' accommodates up to 16 people all on beds (no futons or bunks) and allows multiple families, reunions or corporate retreats to experience the Fraser Valley with exceptional comfort and style. Our home has great multi-use spaces, adults can share a quiet conversation around the fire while kids play ping-pong, games, or watch TV in the downstairs family room. This level opens to a large meadow where sledding, snowman and tunnel building can entertain kids young and old for hours. Your gathering begins in the great room, where you can enjoy the peaceful view of the forest and meadow while preparing your special recipes in the large gourmet fully-equipped kitchen. Our slab table seats 10 or more plus 5 at the kitchen bar. The roundness, large expanse of glass, and warm cedar ceilings make you feel like you're part of the natural surroundings. This level also includes the master bedroom with a private bath and walk in closet, a second and third bedroom, a second full bath, and a deck with gas barbecue and summer patio seating. The sunny, lower level-walkout includes a large family room with a ping-pong table, satellite big screen TV, game table and wet bar; plus two additional bedrooms; full bath and large laundry room with full size washer and dryer. Gaze at the bright stars from the hot tub. Summer activities includes the Winter Park base area with alpine slide, miniature golf, maze, and climbing wall; mountain biking or hiking on many close wooded marked trails, or golf at renown Pole Creek. Enjoy a Rodeo, soak at Hot Sulphur Springs or visit the quaint town of Grand Lake before hiking in famous Rocky Mountain National Park (less crowded south entrance). Devil's Thumb Resort/Spa and YMCA Snow Mountain Ranch offer fantastic restaurants and cross country ski trails. Winter Park has a great rec center with pool slide and climbing wall, fun for all ages. Sleeping accommodations are 1 King bed, 4 Queen Beds, 1 full bed, 4 twin beds, and a crib. We have no futons, bunks, or sleeper sofas. The hot water heating system has 6 separate controls for your comfort. We are continually updating our home with new furniture, mattresses, bedding, towels, etc. and recently thick carpet throughout. We have fast WiFi. Absolutely No Smoking and No Pets. We guarantee you will not be disappointed in your accommodations at the Round House! Downstairs (1750 sq ft): Where the kids like to hang out! Guests comment how the Round House has great 'Energy'. Your group will love it, too! We have lived in Colorado our entire lives, so let us help you with your special plans to help fulfill your vacation dream! The best compliment we have is our MANY returning guests! It's hard to explain the special ambiance of our home. Being Colorado natives, we would love to help you plan your getaway. We are sure you will love the Round House! We love all that Grand County has to offer- Our favorites are the fantastic skiing in the winter and the great mountain biking/hiking in the summer. The ambiance of the Round House with it's warm cedar ceilings and many windows is so conducive to relaxing, you honestly can not leave with out feeling rejuvenated. 2 bathrooms are located upstairs, and one downstairs. Plus there is a full sized laundry room with plenty of room to hang wet ski gear. Lovely Mountain scenery often times guests see fox, moose, bear, or deer. Subdivision has 3/4 to 1 acre lots, so not too rural but nicely private. Only 2.5 miles to grocery store. Many Moose sightings in meadow. Southern facing windows give sunny views of trees, meadow, and amazing sun sets. Meadow is magical for snowman and tunnel building. Cross country ski right out the back door, or walk/drive a short distance to many wooded marked Idlewild trails also called Red Gate Trails. We will call the night you arrive to make sure everything is okay. Local phone is provided in case your cell doesn't work. Room for hanging wet ski clothes to dry. Dishes, wine glasses, cups and utensils for 16+. New big screen tv downstairs and new 40" in master. Many games and toys for various ages are provided. Many toys and games provided. With hooks for skis and lots of fire wood for cozy fire. Seats 8 in summer, views of wildflowers in meadow and trees. Winter Park and Mary Jane are 8 miles away, also there is Granby Ranch geared more for beginners, 16 miles away. Skate or Cross Country skiing, Devil's Thumb 7 miles away or Snow Mtn Ranch 10 miles. Re-known Pole Creek Golf Club is only 10 miles away and Granby Ranch is 16 miles away. NEW 2019 Private with views of peaceful moonlit meadow, seats 8. Meadow is great for snowman and tunnel building! Fraser Tubing Hill is a blast after a day of skiing. Hiking or driving in Rocky Mountain National Park (south entrance is less crowded) is a must in the summer with ice cream and shopping in Grand Lake afterwards. Relax in Sulphur Hot Springs, or kids can enjoy swimming and rock climbing wall at the Rec Center only 3.8 miles away, or bowling and wood fired pizza at the new 'Foundry' while adults take in a movie. There are so many great things to do which are close by: Snowshoeing, Cross Country skiing, Mountain biking, Relaxing, Reading, lots of Fun with Friends and Family!